Jean Wells has been quilting for over 45 years, and teaching others to quilt for more than three decades. She has written more than 30 quilting books and published many, many patterns. Her latest book, Intuitive Color & Design: Adventures in Art Quilting, was published in July 2017. In July 2010, Ms. Wells became the 40th inductee into the Quilter's Hall of Fame. From a young age, all Ms. Wells wanted to do was sew. She dreamed of becoming a fashion designer. A home economics major at Oregon State University in the ‘60s, she enjoyed the diversity of her courses, but sewing classes were her favorites. After graduating in 1965, Ms. Wells pursued a master’s degree in education at Portland State University. It was while teaching middle school home economics that she fell in love with quilting. In 1974, she opened The Stitchin’ Post in her home of Sisters, OR. It is quite possible that The Stitchin’ Post is the oldest quilt shop in the U.S. Certainly it’s the oldest quilt shop still in the hands of its original owner. In acknowledgement of her business acumen, Jean was named recipient of the Michael Kile Award for Lifetime Achievement in 1998, the highest award that the quilting business industry gives. She was also the first quilt shop owner to be inducted into the Independent Retailer Hall of Fame in 1997. She is a founding member of the annual Sisters Outdoor Quilt Show, which she started with a friend as a show-and-tell project for the community. The outdoor show has now grown to an average annual attendance of 12,500, displaying over 1300 quilts from around the world, and includes a week-long quilt school showcasing more than 30 teachers, with an estimated annual economic impact in the Sisters area of $1.7 million. The show and Ms. Wells’s classes draw aspiring quilters to Sisters from all over the country. 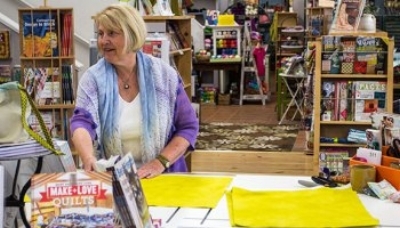 At 74, she doesn’t plan to retire anytime soon, and she says she will always quilt, reinventing herself time and time again in the beautiful fabrics she sews together. We are very honored to have Ms. Wells at BQE 2019!